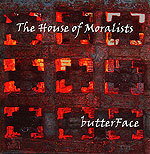 CD review: "The House of Moralists"
Jerry Rigg, the longtime San Diego fixture on bass in outfits ranging from the roots-rocking Road Hogs to Buddy Blue's jump blues bands, steps out front on lead guitar and vocals with butterFace. A hard-rocking trio with a great set of songs on their third relase, butterFace is fairly hard to categorize. There are elements of psychedelia, hard rock, power pop and alt rock. Rigg's lead guitar is aggressive, imaginative and run through a variety of effects boxes, yet still grounded with the kind of rhythmic underpinning a bass player probably can't ever abandon completely. And his singing is pretty darn good, too  okay, he's no Freddy Mercury or even Buddy Blue, but his rough voice has a certain charm and sense of urgency that works well with the band's overall sound. The songs, though, are stellar. "No You Don't" is one of the best hard rock songs to come out of San Diego yet, with a lovely hook coupled to a killer groove. "Lit" has a sort of early '80s anthemic feel to it, while "Put You Down" is dark and moody. And a cover of the late Blue's "Guido Suit" is a nice nod at Rigg's old band leader.